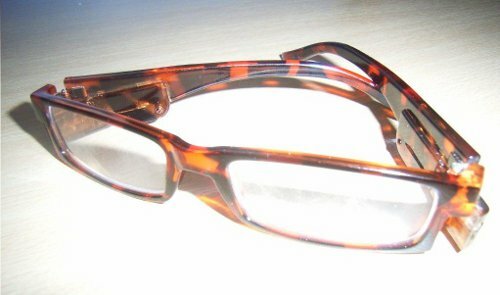 LED glasses with a classic tortoiseshell frame, are lighted reading glasses with built in bright LED lights. The ultimate in task lighting, led glasses, shine a beam of light just where you are looking and only where you are looking. Fancy a bit of bed or bedroom reading of a night time? Put a pair of your LED glasses on, turn on and you have a clear white light, focused on the page, with no annoyance to anyone else, no matter how late your night time reading is. Need to do DIY or handy crafts? Your LED glasses let you work totally hands free. No juggling with torches, or having lighting get in your way. As you can see, we have managed to get the cost down of these lighted glasses, allowing you to easily obtain several pairs to keep around your home. Maybe a pair of LED Lighted reading Glasses for the car to allow for map reading or in case you have to change a tire. Maybe a pair of illuminated glasses in your sewing or tool box. Maybe a light up pair in the smallest room. LED glasses come in a sturdy free box and a choice of magnification, 2 2.5 3, let us know when you order. LED Glasses Tortoiseshell text, images and video are copyright.